ATM Skimmers are on it again! 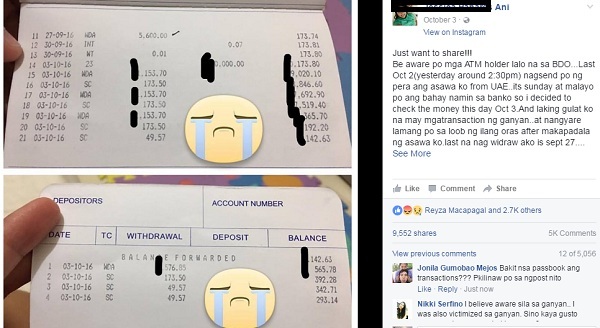 Last October 3, a netizen’s post has become viral because of another case of ATM skimming. The ATM holder, who had an account with Banco De Oro (BDO) said her husband from United Arab Emirates (UAE) , sent her money on October 2, 2016 around 2:30pm. Since it was Sunday, the victim decided to check if the money has landed the day after, October 3. She had the shock of her life when she discovered the money and their savings are gone for life! The victim stated that the last time she took money from their bank account was September 27, so she’s 100% that someone had hacked their bank account. She then contacted BDO for assistance regarding this dilemma, and all that BDO Customer Support can say is that she had withdrawn money from a hacked ATM or is infected with a skimming device and a report would be filed. She would then need to wait for 2 weeks up to 2 months for a resolution, and no expectation that her money will be returned. What’s more shocking is that she’s not the only one who filed a complaint on the same issue, the other victim said they checked in their ATM they had P25,000 on their account and afterwards it became P100. ATM skimming is no longer new to our ears, but it’s really alarming that banks can only advise their account holders to be very careful when withdrawing money, whereas they should be responsible with the security of their ATM machines.